FREEBIE! 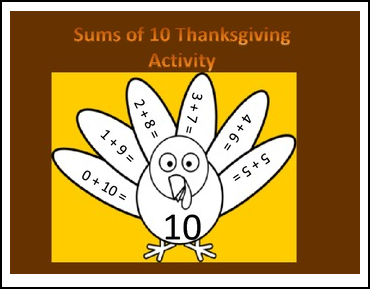 This is a Thanksgiving math activity based on sums of 10. With this activity students will think of numbers that can be added together to equal 10 and record the equations on the turkeys feathers. The activity has built in tiering with 2 sheets for just coloring or using to help come up with equations, 2 sheets that allow students to trace the equations and sum, and a sheet with only the sum given for students who are ready for more of a challenge. I have also provided a blank turkey so other numbers could be used if you wish.